Join Indian Army Recruitment 2019 – Indian Army announced 150 SSC Officers through Armed Forces Medical Services, Officers through Technical Graduate Course (TGC-130) & 10+2 Technical Entry Scheme (TES-42), Recruitment Rally for Soldier GD, Soldier Technical, Soldier Technical (Aviation/ Ammunition Examiner), Soldier Nursing Assistant/Nursing Assistant Veterinary, Soldier Tradesman, Soldier Clerk/ Store Keeper Technical/Inventory Management. 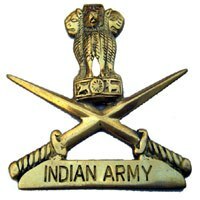 The detailed eligibility and application process for Join Indian Army are given below. Educational Qualification: Candidates who have passed the requisite Engineering Degree course or in the final year of Engineering Degree course are eligible to apply. Note: The candidate studying in the final year of Engg degree course should be able to submit proof of passing by 01 Jan 2020 and produce the Engg Degree Certificate within 12 weeks from the date of commencement of training at IMA. Age Limit (As on 01 Jan 2020): 20 to 27 years. (Candidates born between 02 Jan 1993 and 01 Jan 2000, both dates inclusive). 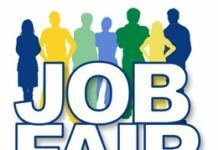 Only shortlisted eligible candidates will be interviewed at one of the Selection Centres by Psychologist, Group Testing Officer and Interviewing Officer. Candidates will be put through two stage selection procedure at the SSB. Those who clear Stage I will go to Stage II. Those who fail in Stage I will be returned on the same day. Duration of SSB interviews is five days. This will be followed by a medical examination of the candidates who get recommended after Stage II. How to apply for Join Indian Army Recruitment 2019 for Officers? All interested and eligible candidates can apply for Officers vacancy through online latest by 9 May 2019. Commencement of TGC-130 Course: Jan 2020. For detailed qualification, selection procedure & Other details available on Army website (www.amcsscentry.gov.in) from 27 April 2019 onwards. The selection process will be based on Interview for shortlisted candidates. All interested and eligible candidates can apply for Officers vacancy through online from 27 April 2019 to 26 May 2019. 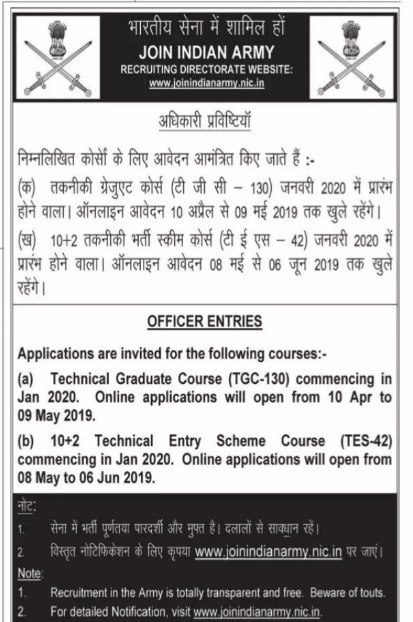 Date of Interview at Delhi: In the month of Jun 2019. Class 10th/Matric pass with 45% marks in aggregate and 33% in each subject. 10+2 / Intermediate Exam Pass in Science with Physics, Chemistry, Maths and English with 50% marks in aggregate and 40% marks in each subject. 10+2 / Intermediate exam pass in Science with Physics, Chemistry, Biology and English with Min 50% marks in aggregate and min 40% marks in each subject. 10+2 / Intermediate Exam pass in any stream (Arts, Commerce, Science) with 60% marks in aggregate and minimum 50% in each subject. Securing 50% in English and Maths/Accounts/Book Keeping in Class 12th is mandatory. Class 10th Simple Pass. (except Syce, Mess Keeper and House Keeper, who may be 8th pass). For Soldier General Duty: 17 years 06 months to 21 years. For Soldiers – Others: 17 years 06 months to 23 years. The selection process is based on Written Test through Common Entrance Examination (CEE), Physical Fitness Test, Physical Measurement and Medical Test. How to apply for Join Indian Army Recruitment Rally? All interested and eligible candidates can apply this rally in online latest by 16 April 2019 to 15 May 2019. Admit cards download: 20 May 2019 to 25 May 2019. Class 10th / Matric pass with 45% marks in aggregate and 33% in each subject. For Boards following grading system minimum of D grade (33-40) in each subjects or grade which contains 33% and overall aggregate of C2 grade. Class 10th Simple Pass. (Class 8th Simple Pass For Syce, House Keeper & Mess Keeper). 10+2/Intermediate exam pass in any stream (Arts, Commerce, Science) with 60% marks in aggregate and minimum 50% in each subject. All interested and eligible candidates can apply this rally in online latest by 18 May 2019. Matric with 45% marks in aggregate (main subjects) and 33% marks in each subject. No stipulation of percentage required if the candidate has higher qualification i.e. 10+2 and above. However, 33% marks in each subject in matric is compulsory. Candidates passing 10th in Grade System will have minimum D grade in each subject and overall aggregate C-2 grade or 4.75 pts. Should have studied and passed Enghsh and Maths/Accounts /Book Keeping in Class Xll with 50% marks in each subject. 10th/ITI (except lvless Keeper and House Keeper/Mess Keeper. who may be 8th pass). All interested and eligible candidates can apply this rally in online latest by 29 April 2019. Gates will be open at 0300hrs and will be closed by 0700hrs on each day. Class 10th Simple Pass. (Class 8th Simple Pass For House Keeper and Mess Keeper). All interested and eligible candidates can apply this rally in online latest by 20 May 2019. Gates will be open at 0200hrs and will be closed by 0630hrs on each day. Class 10th Simple Pass. (Class 8th Simple Pass For Syce, House Keeper and Mess Keeper). All interested and eligible candidates can apply this rally in online from 4 April 2019 to 18 May 2019.
contains 33% and over all aggregate of C2 Grade. Securing 50% in English and Maths / Accounts / Book Keeping in Class XII is mandatory. All interested and eligible candidates can apply this rally in online latest by 16 May 2019. Gates will be open at 0030hrs and will be closed by 0600hrs on each day. and overall aggregate C-2 grade or 4.75 pts. Should have secured 50% marks in each subject and 60 % marks in aggregate in class XII. Should have studied English and Maths/ Accts/ Book Keeping in Class XII and should have secured min 50% marks in each of these subjects in Class XII. Even if a candidate is a graduate or has a higher qualification, percentage marks scored in Cl XII would be applicable towards his eligibility. 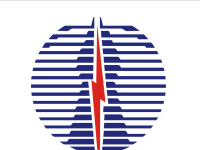 For Soldier Clerk /StoreKeeper Technical: 17 years 06 months to 23 years. All interested and eligible candidates can apply for this rally in online from 4 April 2019 to 18 May 2019. For Boards following grading system minimum of D Grade (33-40) in individual subjects or grade which contains 33% and overall aggregate of C2 grade. 10+2/Intermediate Exam pass in Science with Physics, Chemistry, Maths and English with 50% marks in aggregate and 40% marks in each subject. marks in aggregate and minimum 50% in each subject. Securing 50% in English and Math/Account/Book Keeping in class 12th is mandatory. Class 10th Simple Pass. No stipulation in aggregate percentage but should have scored minimum 33% in each subject. Class 8th Simple Pass (for House Keeper and Mess Keeper). No stipulation in aggregate percentage but should have scored minimum 33% in each subject. All interested and eligible candidates can apply this rally in online latest by 16 April 2019.